This impressive dish looks as though it may take a lot of time and effort, but can be on the table in under half an hour. Great if you’re short of time with a hungry family to feed. for 15 minutes until cooked through. 2. Meanwhile, cook the potatoes in a large pan of boiling water for 13–15 minutes. Add the peas and cook for a further 2 minutes until the potatoes are tender. Drain well and return to the pan. 4. 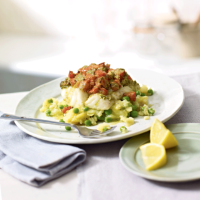 Divide the potato mixture between four plates and top with the cod and tomato-pesto mixture, spooning over any baking juices. For a gluten- and dairy-free version of this dish, swap the butter for olive oil and use Sacla’ Free From — Basil Pesto.